The Raman effect is based on light interacting with the chemical bonds of a sample. Due to vibrations in the chemical bonds the interaction with photons causes specific energy shifts in the back scattered light that appear in a Raman spectrum. The Raman spectrum is unique for each chemical composition and can provide qualitative and quantitative information of the material. Confocal Raman microscopy is a high-resolution imaging technique that is widely used for the characterization of materials and specimens in terms of their chemical composition. Chemical properties of solid and liquid components can be analyzed with diffraction-limited spatial resolution (λ/2 of the excitation wavelength, down to 200 nm). No labeling or other sample preparation techniques are necessary. With Raman images, information regarding the chemical compounds and their distribution within the sample can be illustrated clearly. The WITec Raman microscopes and imaging systems combine an extremely sensitive confocal microscope with an ultra-high throughput spectroscopy system for unprecedented chemical sensitivity. Their outstanding performance in speed, sensitivity and resolution can be jointly applied without compromises. 3D volume scans and depth profiles are valuable tools in providing information about the dimensions of objects or the distribution of a certain compound throughout the sample. WITec's confocal microscope systems provide depth resolution and a strongly reduced background signal and facilitate the generation of depth profiles and 3D images with exceptional spectral and spatial resolution. Images are recorded point by point and line by line, while scanning the sample through the excitation focus. With this technique, the specimen can be analyzed in segments along the optical axis and depth profiles or 3D images can be generated. 3D confocal Raman image of a fluid inclusion in garnet (Red: Garnet, Blue: Water, Green: Calcite, Turquoise: Mica). Scan range: 60 μm x 60 μm x 30 μm. Raman depth-profiling (x-z direction) of a multilayered polymer coating with corresponding spectra. 50 μm x 100 μm scan range, 200 x 200 pixels, 24 000 spectra, acquisition time per spectrum: 50 ms.
3D confocal color-coded Raman image of an emulsion of oil (Green), alkane (Magenta) and water ​​​​​(Blue). 30 μm x 30 μm x 11.5 μm, 150 x 150 x 23 pixels, 517,500 single Raman spectra, total acquisition time: 23 min. 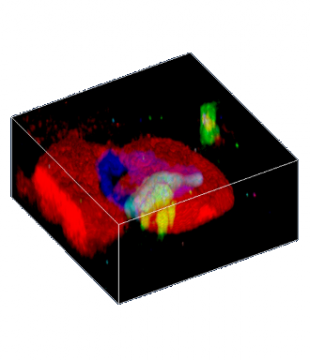 With ultra-fast Raman imaging it is possible to acquire a complete Raman image in a few minutes. In other words the acquisition time for a single Raman spectrum can be as low as 760 microseconds, 1300 Raman spectra can be acquired per second. The latest spectroscopic EMCCD detector technology combined with the high-throughput optics of a confocal Raman imaging system are the keys to this improvement which can also be advantageous when performing measurements on delicate and precious samples requiring the lowest possible levels of excitation power. Time-resolved investigations of fast dynamic processes can also benefit from the ultra-fast spectral acquisition times. Reduced overall experiment time, while delivering more valuable data in a given time leads to reduced cost of ownership. 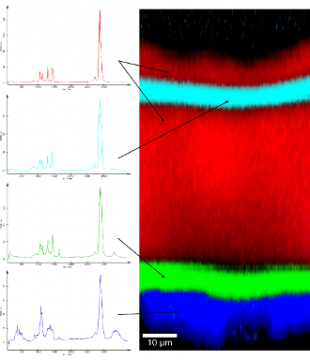 Time-crucial operations in standard Raman imaging can be rapidly performed. Delicate and precious samples requiring lowest levels of excitation power are ideally suited for analysis. Time-resolved Raman measurements allows for the investigation of fast dynamic processes (spectra and/or image series). The modular design of the WITec systems allows to combine various imaging techniques such as Raman imaging, fluorescence, luminescence, atomic force microscopy (AFM), and near-field microscopy (SNOM or NSOM) and in one single instrument for a more comprehensive sample analysis. Switching between the different modes is simply done by rotating the microscope turret. 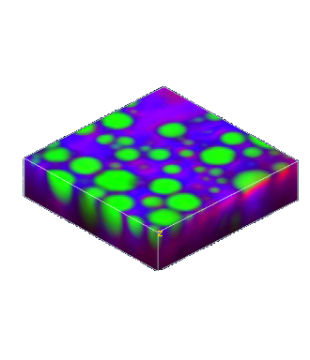 By combining confocal Raman imaging with AFM, the chemical properties of the sample can be easily linked with the surface structure. These two complementary techniques are available in combined Raman-AFM WITec microscopes for flexible and comprehensive sample characterization. 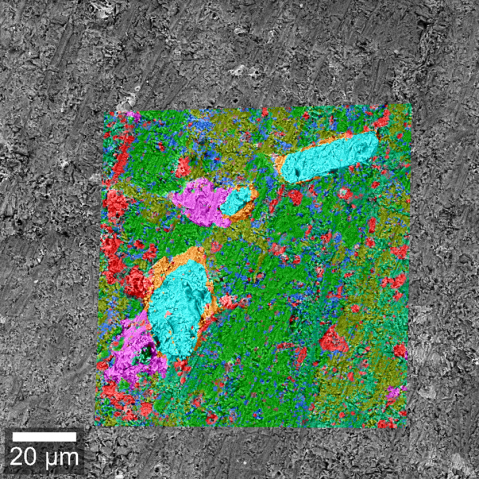 The Raman-SEM combination is a relatively new correlative microscopy technique. Structures in the nm-range detected by SEM can now be correlated to chemical Raman imaging from the same sample area. The WITec confocal Raman imaging systems provide a spatial resolution of down to 200 nm laterally and 780 nm vertically. However, some particular applications require Raman information with resolutions below the diffraction limit (< 200 nm). WITec microscope systems are ideally suited for these purposes due to their capability to combine several microscopy techniques within one microscope setup to overcome the diffraction limit. Near-field Raman imaging is an exceptional microscopy technique which links chemical Raman information to high-resolution Scanning Near-field Optical Microscopy (SNOM). Thus near-field Raman allows for the acquisition of complete high-resolution confocal Raman images. Typically, lateral resolutions of below 100 nm can be achieved. Through the unique combination of a high-throughput spectroscopic system with the cantilever-based SNOM technique of the WITec Raman-SNOM microscope, an unrivaled sensitivity and imaging quality can be provided by a single microscope setup. The excitation laser light is focused through the SNOM-tip resulting in a “near-field” (evanescent field) on the far side of the aperture. While the sample is moved on a piezo-driven scan stage, the transmitted light is spectroscopically detected point-by-point and line-by-line in order to generate a hyperspectral Raman image. The optical resolution of the transmitted light is thereby only limited by the diameter of the aperture (< 100 nm). Using a beam deflection setup as in AFM contact mode, it is ensured that the cantilever is always in contact with the sample. In addition the topography can be recorded simultaneously to the measurement. Tip-Enhanced Raman Spectroscopy (TERS) enables the acquisition of chemical information with a lateral resolution far below the diffraction limit. The TERS measurement technique is a combination of Surface-Enhanced Raman Scattering (SERS) with Scanning Probe Microscopy (SPM) techniques such as Atomic Force Microscopy (AFM). 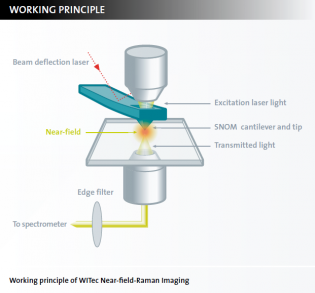 WITec’s unique microscope systems with Raman and AFM technique integrated in one instrument provide optimized instrumentation and are ideally suited for TERS experiments. The TERS effect is assumed to be based on surface plasmons and chemical resonance effects resulting in enhanced electrical fields and increased Raman signal intensities. To obtain the TERS effect a metal-coated AFM-tip can be used as a nanostructure. The excitation laser light is focused onto the tip-apex to enhance the Raman signal in close proximity to the tip. The lateral resolution is thereby dependent on the tip-apex size (10 – 20 nm). The TERS tip illumination can be applied from either above, below or from the side. The WITec microscope systems provides the beam path geometry for all excitation approaches: The inverted microscope is ideal for TERS experiments on transparent samples while the upright microscope and the side illumination enable TERS measurements of opaque samples.